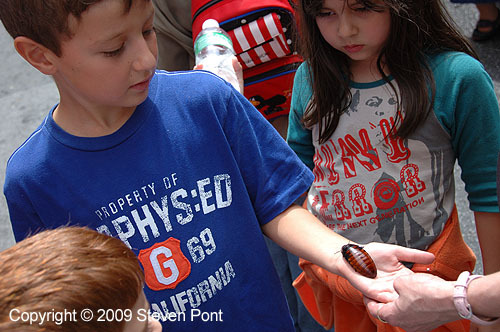 This is a picture of an eight-year-old boy holding a cockroach -- A Huge Frickin' Cockroach. (That sounds even better if you say it with a Scottish accent, but then again, what doesn't?) I was eight years old once, many moons ago, and I don't remember a time then or now when I would have held a huge Madagascar hissing cockroach in my hand. Not long ago, I would have freaked out just knowing these things existed, and there's my son calmly holding one in his hand looking like he wants to pet it. If I weren't so grossed out by the possibility of splatter, I would have stepped on the damn thing.